One good thing about living in England is that there are lots of really old books still around! And so one year, Wil decided that he would buy me a few really old books, one for my birthday, one for Christmas…that kind of thing. At this time I was a Catholic studying theology at a Catholic college, and we often had our parish priests over for dinner. So one time I was telling them about my old books, and brought them out to look at. I told them that one of the books, from 1857, was a collection of stories about the martyrs of the church, but as they began looking inside they began to chuckle, and then they said, “These are the wrong martyrs – they are Protestants.” I was surprised, because of course I had only admired the books but not read these stories closely. I had been slow to realize that there were of course people who died for their Protestant faith as did Catholics for theirs. And I was embarrassed – trust Wil to get me a book about martyrs from the wrong religion! To Catholics, the people in this book are heretics – remember, though, that the word ‘heretic’ means ‘to make a choice’. Now that my spiritual path has taken me from Catholicism into the midst of ‘heresy’, learning about the history of those who objected to the practices, teachings, and theology of the Roman Catholic Church has been fascinating. It exposes me to my own misperceptions about the Reformation: it was not a seamless process, and there was a lot of internecine warfare. My reading for this sermon challenges me to appreciate once again the free faith of Unitarian Universalism, which arose from the writings and actions of people like Francis David and Michael Servetus. Autumn is an appropriate time of year to remember these two men: Francis David died November 7th in1579; Michael Servetus was burned at the stake at the end of October in 1553. David was influenced by the writings of Servetus, so it is worth talking a bit about him first. Michael Servetus was a Spaniard born in the first decade of the 16th century, who as a young man studied law in France. During these years of his university education he began to read the Bible – and remember that this was shortly after the invention of the printing press, which made the Bible accessible to people other than the elite of the Church. To his surprise, Servetus found no explicit mention of the doctrine of the Trinity in the Bible. And the rejection of this doctrine is what first brought the Unitarian movement into being (Howe, 3); Unitarianism is traditionally known as a Christian heresy which affirms not three persons – Father, Son, Holy Spirit - but the unity of God. The concept of the Trinity takes Christianity a long way from the Jesus of the Gospels; that Jesus was a leader of a Jewish group that saw him as sent by God but human. Once the Christian movement spread outside Jewish circles, the Greek influence on this understanding of Jesus drew upon abstract philosophical concepts such as the Logos, or ‘Word’ which is featured in the Gospel of John. The emperor Justinian is responsible for codifying into Roman law the creed that was adopted at the Council of Nicea in 325 of the Common Era. This creed identifies the relationship between God, Jesus Christ, and the Holy Spirit. The argument for the Trinity to become an article of orthodox belief was an attempt to deal with several heretical groups, like the Docetists, who said that Christ only appeared to be human but was in fact divine, and the Sabellians, who said that God operated in three modes but did so in only one role at a time. And Arians decided that Jesus was somewhere between human and divine. The interesting thing is that, although Servetus did not find the Trinity in the Bible, he did in fact believe in a version of the Trinity; he was never a Unitarian in the way we might think. And when Servetus left university to be a part of the entourage of the Emperor Charles V, his opposition to the church shifted for a time from its theology to its practices. He was amazed to see at the emperor’s coronation how the pope was the object of adoration, and to see the extent to which the church was the possessor of much wealth. Servetus joined the Protestant reform movement soon after; his first attack on traditional Catholic belief came in 1531 with the publication of “On the Errors of the Trinity”. His argument was similar to the Sabellians, but he thought that the saving work of Christ would eventually draw all people to God, so that Christ as mediator would become an unnecessary role of God. Servetus found himself moving around Europe to evade the Catholic Inquisition, and this is where the most dastardly part of his story occurs. John Calvin, the leader of the Reformation movement in Geneva, was the one who eventually betrayed Servetus to the Catholic Inquisition. 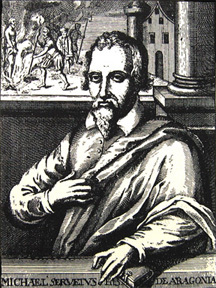 Servetus had spent two decades living under the name Michel de Villenueve as a doctor of medicine, and during that time he was the first person to study and report on the pulmonary circulation of blood. However he could not keep away from the idea of publishing more of his theological ‘ravings’, as Calvin described them, and before he published The Restoration of Christianity he sent a draft copy to Calvin under an assumed name. The identity of Villenueve was revealed to Catholic inquisitors, but it was in 1553 at a church service in Geneva where Servetus was recognized and seized by Protestant authorities. I used to wonder why, when he knew he was a hunted man, Servetus would appear at a church service; but it has been pointed out by some writers that, at that time, not to go to church was more conspicuous than going. So once it was proven that his written heresy was destructive to social order and morality – and with John Calvin in the role of prosecutor – Servetus was convicted and sentenced to be burned at the stake. Calvin asked that he only be beheaded and Servetus requested dying by the sword, but he was taken outside the city gates and burned on October 27 1553. In the flames Servetus cried out, “O Jesus, Son of the Eternal God, have pity on me”; a witness to the execution observed that if only he had worded it ‘Jesus, the Eternal Son of God’ he would have been spared. 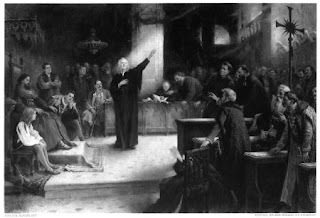 Many Reformers were appalled by the execution and Calvin even put out a tract soon after that attempted to defend it; the month after that, a book was published entitled, “Concerning Heretics, Whether They Are To Be Persecuted”. It called for greater tolerance and even included a supporting passage from Calvin’s own writings, much to his annoyance. The book’s author declared, “We are all heretics in the eyes of those who do not share our views…Let us be tolerant towards one another, and let no one condemn another’s belief.” (Howe, 42) So part of the legacy of Servetus is the spread of an encouragement of religious tolerance in Europe. In 1568 Unitarianism began in Transylvania, influenced by the teachings of Michael Servetus. Francis David studied in Wittenberg as a Catholic and came back to Transylvania to find that the ideas of the Reformation he’d already encountered in Wittenberg had spread to his homeland. By 1555 he had renounced Catholicism and became a Lutheran minister. But he was slowly persuaded by the arguments of the local Calvinists on the contentious issue of the nature of the Lord’s Supper to move away from the Lutheran understanding – that it is the real presence of Christ in the bread and wine – to the Calvinist – that the Spirit is present (Howe, 96). By 1564 David had become the bishop of the Calvinist or Reformed Churches. The King of Transylvania at the time was John Sigismund, he of the story earlier, and the king for whom the tune for “Gathered Here” is named. In just a couple of years, once David became King John’s court preacher and was exposed to the ideas of Giorgio Biendrata, a royal physician and anti-Trinitarian, David became a Unitarian. Talk about a spiritual journey! In January 1566 David preached his first Unitarian sermon, and soon he was being accused by Calvinists of being a heretic. David and Biendrata published a book called The False and True Knowledge of God which clearly showed how influential Servetus had been on their theological evolution. Only two years later King John decided to call the debate at Torda to try to end the escalation of religious controversy in his country – there were actually three meetings with this purpose: the first resulted in the creation of the Act of Religious Tolerance and Freedom of Conscience. The second was the general synod that featured the ten-day debate. In 1571 Unitarianism was decreed by King John as one of the country’s ‘received religions’, alongside Catholicism, Calvinism and Lutheranism. Ironically this was King John’s last official act, because the next day on his way to a hunting exhibition he was seriously injured when his carriage overturned, and he died without an heir two months later at the age of 30. The constitutional status of Unitarianism was ensured but for David personal troubles began; He was replaced as court preacher, and a new law forbidding any changes in religious doctrine or practice was passed. David’s evolving thoughts on the divinity of Christ and the Calvinist doctrines of salvation and predestination were expressed through public preaching, and eventually he found himself under arrest. His trial was conducted in 1579, prosecuted by Biandrata who was now the court’s legal counsel. David had become ill, and was extremely weak when he was condemned to life imprisonment, and he died soon after in a dungeon cell. Now, the dramatic arguments and fights to the death about doctrine may leave some of us cold; what kinds of personal passions would cause us to give our lives in defense of them? When considering the legacy of a free faith, I am humbled when I read about and reflect upon the lives of people like Michael Servetus and Francis David. We still have today people who, only in death, affect change on attitude and in social norms and in religious values. Maybe I am not passionate enough to argue about the ideas of the humanity of Jesus Christ or the doctrine of election, but the effect of those ideas on the evolution of religious practice are important because they led to the Unitarian Universalism that we know today. Charles Howe says that Unitarianism should be characterized not in terms of theology but “in terms of a growing commitment to three basic principles: complete freedom of religious thought; the unrestricted use of reason; and tolerance of differing views and practices” (3). Some of us may have heard the claim that as UUs, we can believe whatever we like. Is that true? We certainly hold the door open for Humanists and Christians, Pagans and Buddhists, Agnostics and Jews, to name a few. But we are a covenantal community, asking our members to live their lives in accordance with our seven principles. With freedom comes responsibility. So what will you do with your free faith? Will you use it in debate and discussion to liberate others from the dungeon cells of their own religious dogma? Will you live it out in welcoming diversity of belief and identity into this community? Will you take it out into the world and live it? The challenge is before us as Unitarian Universalists to be responsible with our free faith, to make it the foundation of our vision for a better world. As heretics we make choices: the choice to affirm the inherent worth and dignity of each person. The choice to affirm justice, equity, and compassion in human relations. The choice to accept and encourage spiritual growth, and a free and responsible search for truth and meaning. The choice to affirm the right of conscience and the democratic process. The choice to promote the goal of world community with peace, liberty, and justice for all. And the choice to promote respect for the interdependent web of all existence of which we are a part. I choose a free faith. Howe, Charles A. For Faith and Freedom. Boston: Skinner House, 1997. Wells, B and Jaco B ten Hove. Articulating Your UU Faith. Boston: UUA Books, 2003.